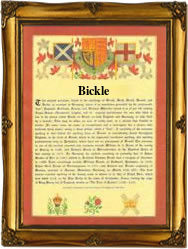 Recorded as Bickle, Bickell, Bickel and probably others, this is an English surname. It is chiefly to be found in the county of Devon, and is a variant of Bickley. This is a locational name from places called Bickley in the county of Cheshire, recorded as "Bicheleia" in the Domesday Book of 1086; in Worcestershire, appearing as "Bykeleg" in Worcestershire records; in Kent, recorded as "Byckeleye" in the Feet of Fines in 1279; or Bickleigh in Devonshire, recorded as "Bichelia" in the Domesday Book. These all share the same meaning and derivation, and translate as "Bicca's clearing". Early examples of the surname include the marriage of Rychord Bickell in 1580 at Spreyton in Devonshire; the christening of Ede, daughter of William Bickle in April 1586, at Hathesleigh, Devonshire; the marriage of Thomas Bickle and Jane Preste at Boyton, Cornwall, on November 27th 1598. Thomas Bickel was granted a ticket to travel to the "Bermudes", aboard the sloop May Flower on April 7th 1679. A coat of Arms, depicting a chevron crenelle between three black griffins' heads, was granted to a Bickley family at Chidham in Sussex. Surnames became necessary when governments introduced personal taxation. In England this was known as Poll Tax. Throughout the centuries, surnames in every country have continued to "develop" often leading to astonishing variants of the original spelling.